The word wasn’t well enunciated due to the lancer I was holding between my teeth. It was a very cold, very early morning on a road just outside of Disney World. I was in a sea of fellow runners about to start the first Disney marathon of the year. But what set me apart was the pricking of my fingers for blood to apply to my Precision Xtra strips for both glucose and ketones. And unfortunately, the strips were failing. 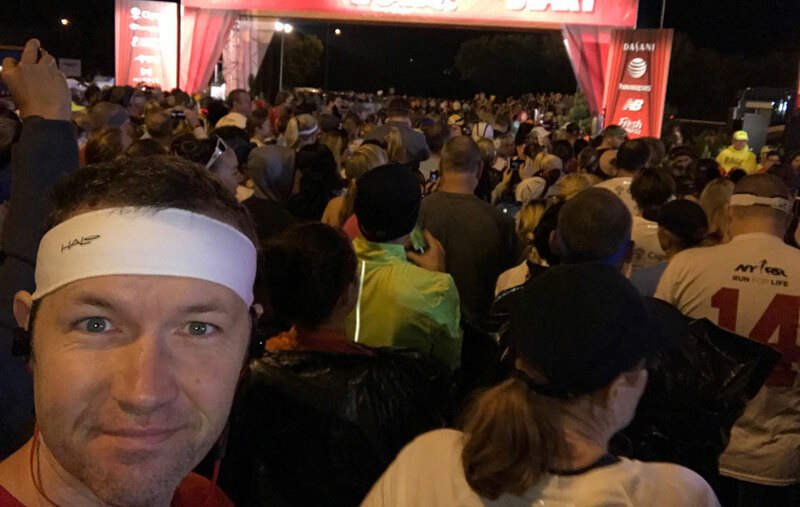 As our corral moved slowly to the start line, waiting for our turn to be released, my head was tilted down trying desperately to get a solid reading. After a couple of failed strips, I managed to get a successful test from each. The shift in the numbers was as expected. I have an opinion of the “Dawn Phenomenon” you may have read about, but more on that later. The plan was simple… on paper. 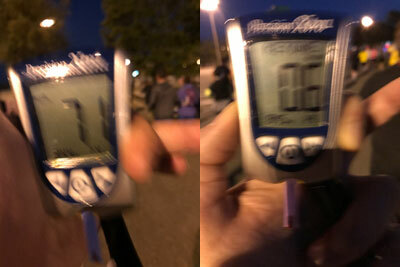 At about every 5 kilometers, I was going to slow down and take both glucose and BHB. While I was excited for the new data, I was woefully undertrained, having my longest practice run before this day at only 6.5 miles. Ack! To my surprise, I was able to run the first 30k with only slow downs to take my numbers. In college one of my professors once said, “Successful experiments make for great data. Failed experiments make great stories.” In this post, I have a little from Column A and a little from Column B. At the 30k mark I whipped out my iPhone which by this point was at just 30% power. I then reached for the lancer to my Precision Xtra only to find it missing. As I was running, the lancer had fallen out of my pocket. A wave of frustration and disappointment hit me all at once. I was so careful to use the zipper pocket specifically to prevent something like this from occurring. Yet somewhere between the 25 and 30k markers the zipper had widened on its own and the lancer snuck its way out while I was probably listening to Jump Around by House of Pain. After checking and rechecking my other pockets several times, I finally mustered a restart to my pace. But my rhythm was different now. I couldn’t keep from stewing as I made my way forward. If you’ve ever ran a half or full marathon, you know how in many ways it’s much more a mental exercise than a physical one. And unfortunately, this was clearly a moment when my spirit left me. Over the next several miles, a few other key things went wrong which I won’t go into here. But regardless, I wasn’t able to resume my blood testing until after my wife joined me at the finish line and we returned to the hotel. I was pretty hungry, so I had two bowls of AdaptMeal (4 portions total) while my wife was icing her legs. I planned to keep testing my blood every hour for the next several hours. In the middle of the meal my alarm went off so I took my numbers again. We finished up and went back to the hotel. Both my wife and I laid down to watch a movie and found ourselves falling asleep (shocker!). I set an alarm for one hour, but my sleep self hit cancel when it went off and I instead woke up after two hours. At this point my wife and I settled in to watch the Golden Globes and I decided not to take my numbers again until I was heading to bed. I went to sleep, then woke up on my own at 6:25 am. Since I was planning to get my blood drawn for a full lab workup as part of this experiment, I decided to start my day. After a very long wait, I finally get my blood drawn and happily closed the chapter on this experiment. What was I looking to find? This was the final experiment in a series related to exercise that actually goes back to August of last year. 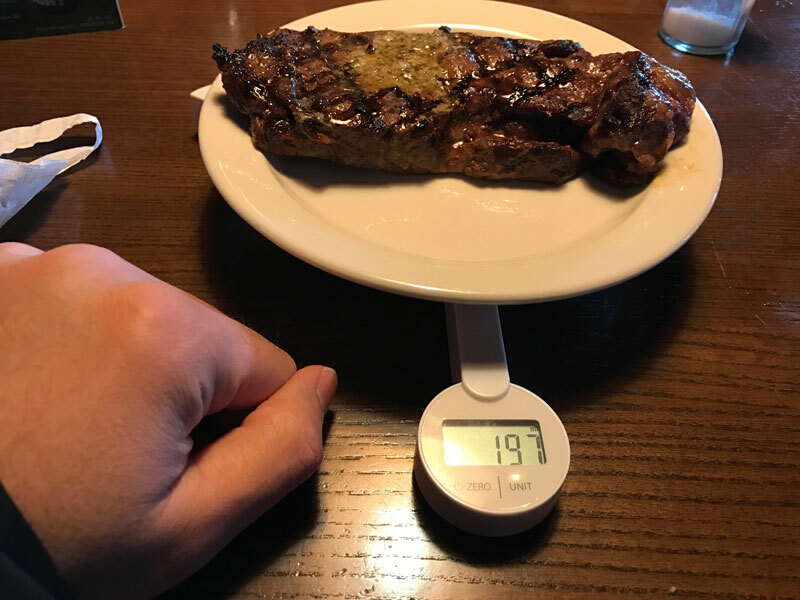 If you’ve been following my blog for a while, you’ll note I’ve been adamant about trying to control for variables I assumed would affect my cholesterol numbers. The biggest of these variables would likely be energy demand from exercise. One of the coolest things I’ve come to understand is that there is an anticipatory management effect with metabolism from regular, ongoing exercise. In layperson’s terms, the body is constantly figuring out what you keep doing with it and trying to front run those energy needs. There’s clearly a global “priming” of cells with energy by the body. Yet there’s an equally strong counter regulation to preserve the energy you already have for survival. Use only as much as you need and save everything else. So how much exercise and with what frequency drives this regulatory anticipation? How much of that is glucose vs fatty acids vs ketones? How much does this depend on sleep? Timing of the day? Warm ups, pre-exercise routines, or snacking? Obviously there’s a lot to unwind and I can’t reveal the patterns I have discovered yet until I’ve gotten more of them reproduced and verified. The next few months I’ll be… sedentary! Probably from now until about mid March. After that I’ll be shifting gears heavily into intense resistance training. Extra credit if you know why I consider these the obvious next phases. How did lab results compare with your meter? I often find that when I’ve planned a careful experiment, something unexpected happens. 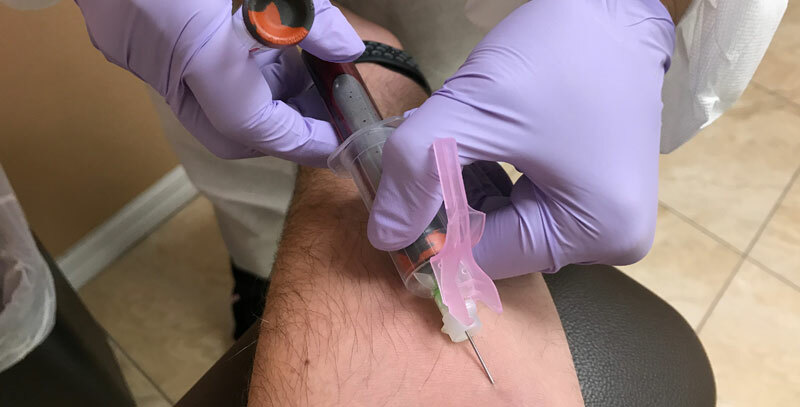 One time when I was doing a test comparing regimens, the hospital lab’s machine broke so they sent the blood to another lab, and different labs can get different results, so the experiment was meaningless. Other times I’ll come down with a bad cold on the day I was supposed to test. Or I get an urgen telephone call just at the crucial time point. I assume you know about Attia’s metabolic ward experiment. He documented the effect of meals and exercise on blood glucose and ketones. Yes, I’m very acquainted with Attia’s work. I consider his Straight Dope on Cholesterol one of the best reads in my education on the subject (even if I disagree with a few of the conclusions now). How did you enjoy the Disney Marathon? I’ve run it a few times several years ago. Did you consume any gels during the run? I did not, no. I try to stick to just water and salt for before, during and after. In fact, I had about 21g of pink salt (dissolved in water) from the evening before to the aftermath of the race. Much less and I’d have had some problems. My cholesterol is high according to my normal blood testing. I would like to have a specialized test done. I live in Burlington NC. What test should I ask my doctor to do? My last test was about 3 weeks into LCHF. I have been low carb, high fat for about 4 months. Messed up a few times, but jumped back on board. Being so woefully under-trained probably affected the readings to a great extent (BG nose-diving after 10K and ketones taking off). If you were well trained on an LCHF background, I’d expect your BG to remain more stable, since you’d be better able to utilise “fat” at that %VO2max and would conserve glucose. This is what I have see in my own tests. put away fats to be copied as vitality. I have been running for 17 years now. I started looking into the keto diet because my daughter has Prader-Willi syndrome and I was looking for anything to help her. I discovered Peter Attia, Tim Noakes, Gary Taubes, Steve Phinney, Jeff Volek and a number of others. I tried the keto diet but found it difficult with a family and settled with LCHF. I know there can be other factors but I must say I had one of my best years of running ever. I had several PB’s and many 2nd bests. I was able to run 35km with no breakfast and only water. The part that was hardest was trying to run a full marathon with nothing and maintain a fast race pace. In the end I used gels only during races and it worked like “rocket fuel” as I describe it. I’ve settled in recently to a few more carbs mostly from vegetables and nuts as I worry about not getting enough fibre on LCHF. I have also retired the marathon at number 20. I question the health benefits of so much running. Hoping to do more yoga, lift some weights and stick to 1/2’s in the future.